The orbit of Sirius B around A as seen from Earth (slanted ellipse). The wide horizontal ellipse shows the true shape of the orbit (with an arbitrary orientation) as it would appear if viewed straight on. ^ Two full 50.09-year orbits following the periastron epoch of 1894.13 gives a date of 1994.31. ^ a b c d e f g h i j k l Liebert, J.; Young, P. A.; Arnett, D.; Holberg, J. B.; Williams, K. A. (2005). “The Age and Progenitor Mass of Sirius B”. The Astrophysical Journal 630 (1): L69-L72. arXiv:astro-ph/0507523. Bibcode: 2005ApJ...630L..69L. doi:10.1086/462419. ^ a b Hinckley, Richard Allen (1899). Star-names and Their Meanings. New York: G. E. Stechert. pp. 117-25. https://books.google.com/?id=5xQuAAAAIAAJ. ^ Singh, Nagendra Kumar (2002). Encyclopaedia of Hinduism, A Continuing Series. Anmol Publications PVT. LTD. p. 794. ISBN 81-7488-168-9. ^ Spahn, Mark; Hadamitzky, Wolfgang; Fujie-Winter, Kimiko (1996). The Kanji dictionary. Tuttle Publishing. p. 724. ISBN 0-8048-2058-9. ^ a b Gingerich, O. (1987). “Zoomorphic Astrolabes and the Introduction of Arabic Star Names into Europe”. Annals of the New York Academy of Sciences 500: 89-104. Bibcode: 1987NYASA.500...89G. doi:10.1111/j.1749-6632.1987.tb37197.x. ^ Brosch, Noah (2008). “Modern optical measurements”. Astrophysics and Space Science Library 354: 89-117. doi:10.1007/978-1-4020-8319-8_5. ISBN 978-1-4020-8318-1. ISSN 0067-0057. ^ a b Adelman, Saul J. (2005). “The physical properties of normal A stars”. Proceedings of the International Astronomical Union 2004 (IAUS224): 1-11. doi:10.1017/S1743921304004314. ISSN 1743-9213. ^ a b Royer, F.; Gerbaldi, M.; Faraggiana, R.; Gómez, A. E. (2002). “Rotational velocities of A-type stars. I. Measurement of v sin i in the southern hemisphere”. Astronomy and Astrophysics 381 (1): 105-121. arXiv:astro-ph/0110490. Bibcode: 2002A&A...381..105R. doi:10.1051/0004-6361:20011422. ^ a b Aurière, M. (November 2010). “No detection of large-scale magnetic fields at the surfaces of Am and HgMn stars”. Astronomy and Astrophysics 523: A40. arXiv:1008.3086. Bibcode: 2010A&A...523A..40A. doi:10.1051/0004-6361/201014848. ^ a b Qiu, H. M.; Zhao, G.; Chen, Y. Q.; Li, Z. W. (2001). “The Abundance Patterns of Sirius and Vega”. The Astrophysical Journal 548 (2): 953-965. Bibcode: 2001ApJ...548..953Q. doi:10.1086/319000. ^ a b Holberg, J. B.; Barstow, M. A.; Bruhweiler, F. C.; Cruise, A. M.; Penny, A. J. (1998). “Sirius B: A New, More Accurate View”. The Astrophysical Journal 497 (2): 935-942. Bibcode: 1998ApJ...497..935H. doi:10.1086/305489. ^ Sweeney, M. A. (1976). “Cooling times, luminosity functions and progenitor masses of degenerate dwarfs”. Astronomy and Astrophysics 49: 375. Bibcode: 1976A&A....49..375S. ^ a b c d e f g van den Bos, W. H. (1960). “The Orbit of Sirius”. Journal des Observateurs 43: 145-151. Bibcode: 1960JO.....43..145V. ^ a b Paul Kunitzsch; Tim Smart (2006). A Dictionary of Modern Star Names. Sky Publishing. p. 22. ISBN 978-1-931559-44-7. ^ Schaaf, Fred (2008). The Brightest Stars. Hoboken, New Jersey: John Wiley & Sons. p. 94. ISBN 0-471-70410-5. https://books.google.com/?id=LvnNFyPAQyUC&pg=PA94&lpg=PA94#v=onepage&q 2017年1月28日閲覧。. ^ Holberg 2007, pp. 4-5. ^ Wendorf, Fred; Schild, Romuald (2001) (Google Book Search preview). Holocene Settlement of the Egyptian Sahara: Volume 1, The Archaeology of Nabta Plain. Springer. p. 500. ISBN 0-306-46612-0. https://books.google.com/?id=qUk0GyDJRCoC&pg=PP1&dq=isbn=0-306-46612-0 2017年1月28日閲覧。. ^ Holberg 2007, p. 32. ^ Aitken, R. G. (1942). “Edmund Halley and Stellar Proper Motions”. Astronomical Society of the Pacific Leaflets 4: 103-112. Bibcode: 1942ASPL....4..103A. ^ Holberg 2007, pp. 41-42. ^ Daintith, John; Mitchell, Sarah; Tootill, Elizabeth; Gjertsen, D. (1994). Biographical Encyclopedia of Scientists. CRC Press. p. 442. ISBN 0-7503-0287-9. ^ Huggins, W. (1868). “Further observations on the spectra of some of the stars and nebulae, with an attempt to determine therefrom whether these bodies are moving towards or from the Earth, also observations on the spectra of the Sun and of Comet II”. Philosophical Transactions of the Royal Society of London 158 (0): 529-564. Bibcode: 1868RSPT..158..529H. doi:10.1098/rstl.1868.0022. ^ Huygens, Christiaan, ΚΟΣΜΟΘΕΩΡΟΣ, sive De terris cœlestibus (The Hague, 1698), p. 137. ^ Henderson, T. (1840). “On the Parallax of Sirius”. Memoirs of the Royal Astronomical Society 11: 239. Bibcode: 1840MmRAS..11..239H. ^ Flammarion, Camille (August 1877). 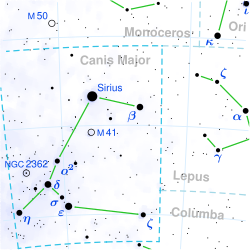 “The Companion of Sirius”. The Astronomical Register 15 (176): 186-189. Bibcode: 1877AReg...15..186F. ^ Appletons' annual cyclopaedia and register of important events of the year: 1862. New York: D. Appleton & Company. (1863). p. 176. https://archive.org/stream/1862appletonsan02newyuoft#page/n183/mode/1up. ^ Benest, D.; Duvent, J. L.; Duvent (July 1995). 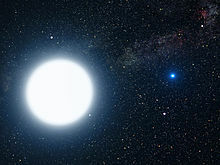 “Is Sirius a triple star?”. Astronomy and Astrophysics 299: 621-628. Bibcode: 1995A&A...299..621B. - For the instability of an orbit around Sirius B, see § 3.2. ^ Bonnet-Bidaud, J. M.; Pantin, E. (October 2008). “ADONIS high contrast infrared imaging of Sirius-B”. Astronomy and Astrophysics 489 (2): 651-655. arXiv:0809.4871. Bibcode: 2008A&A...489..651B. doi:10.1051/0004-6361:20078937. ^ Adams, W. S. (December 1915). “The Spectrum of the Companion of Sirius”. Publications of the Astronomical Society of the Pacific 27 (161): 236-237. Bibcode: 1915PASP...27..236A. doi:10.1086/122440. ^ Holberg, J. B. (2005). 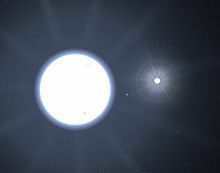 “How Degenerate Stars Came to be Known as White Dwarfs”. American Astronomical Society Meeting 207 207: 1503. Bibcode: 2005AAS...20720501H. ^ Brown, R. Hanbury; Twiss, R. Q. (1958). “Interferometry of the Intensity Fluctuations in Light. IV. A Test of an Intensity Interferometer on Sirius A”. Proceedings of the Royal Society of London 248 (1253): 222-237. Bibcode: 1958RSPSA.248..222B. doi:10.1098/rspa.1958.0240. ^ Barstow, M. A.; Bond, Howard E.; Holberg, J. B.; Burleigh, M. R.; Hubeny, I.; Koester, D. (2005). “Hubble Space Telescope spectroscopy of the Balmer lines in Sirius B”. Monthly Notices of the Royal Astronomical Society 362 (4): 1134-1142. arXiv:astro-ph/0506600. Bibcode: 2005MNRAS.362.1134B. doi:10.1111/j.1365-2966.2005.09359.x. ^ Holberg 2007, p. 157. ^ Holberg 2007, p. 158. ^ Holberg 2007, p. 161. ^ Holberg 2007, p. 162. ^ a b c Whittet, D. C. B. (1999). “A physical interpretation of the 'red Sirius' anomaly”. Monthly Notices of the Royal Astronomical Society 310 (2): 355-359. Bibcode: 1999MNRAS.310..355W. doi:10.1046/j.1365-8711.1999.02975.x. ^ Holberg 2007, p. 163. ^ 江晓原 (1992). (Chinese)天文学报 33 (4). ^ Jiang, Xiao-Yuan (April 1993). “The colour of Sirius as recorded in ancient Chinese texts”. Chinese Astronomy and Astrophysics 17 (2): 223-228. Bibcode: 1993ChA&A..17..223J. doi:10.1016/0275-1062(93)90073-X. ^ Schlosser, Wolfhard; Bergmann, Werner (1985). “An early-medieval account on the red colour of Sirius and its astrophysical implications”. Nature 318 (6041): 45-46. doi:10.1038/318045a0. ISSN 0028-0836. ^ McCLUSKEY, STEPHEN C. (1987). “The colour of Sirius in the sixth century”. Nature 325 (6099): 87. doi:10.1038/325087a0. ISSN 0028-0836. ^ Van Gent, R. H. (1987). “The colour of Sirius in the sixth century”. Nature 325 (6099): 87-89. doi:10.1038/325087b0. ISSN 0028-0836. ^ Kuchner, Marc J.; Brown, Michael E. (2000). “A Search for Exozodiacal Dust and Faint Companions near Sirius, Procyon, and Altair with the NICMOS Coronagraph1”. Publications of the Astronomical Society of the Pacific 112 (772): 827-832. doi:10.1086/316581. ISSN 0004-6280. ^ a b Holberg 2007, p. xi. ^ Holberg 2007, p. 82. ^ Henshaw, C. (1984). “On the Visibility of Sirius in Daylight”. Journal of the British Astronomical Association 94 (5): 221-222. Bibcode: 1984JBAA...94..221H. ^ a b Holberg 2007, p. 214. ^ Backman, D. E. (30 June - 11 July 1986). Gillett, F. C.. ed. IRAS observations of nearby main sequence stars and modeling of excess infrared emission. Toulouse, France: COSPAR and IAF. Bibcode: 1986AdSpR...6...43B. ISSN 0273-1177. ^ Brosch 2008, p. 126. ^ “High-contrast imaging of Sirius A with VLT/SPHERE: looking for giant planets down to one astronomical unit”. Monthly Notices of the Royal Astronomical Society 454 (1): 129-43. (2015). doi:10.1093/mnras/stv1928. ^ a b c d Kervella, P.; Thevenin, F.; Morel, P.; Borde, P.; Di Folco, E. (2003). “The interferometric diameter and internal structure of Sirius A”. Astronomy and Astrophysics 407 (2): 681-688. arXiv:astro-ph/0306604. Bibcode: 2003A&A...408..681K. doi:10.1051/0004-6361:20030994. ^ Aufdenberg, J.P.; Ridgway, S.T. (2006). “First results from the CHARA Array: VII. Long-Baseline Interferometric Measurements of Vega Consistent with a Pole-On, Rapidly Rotating Star?” (PDF). Astrophysical Journal 645 (1): 664-675. arXiv:astro-ph/0603327. Bibcode: 2006ApJ...645..664A. doi:10.1086/504149. http://www.chara.gsu.edu/CHARA/Papers/Paper6.pdf. ^ Petit, P. (August 2011). “Detection of a weak surface magnetic field on Sirius A: are all tepid stars magnetic?”. Astronomy and Astrophysics 532: L13. arXiv:1106.5363. Bibcode: 2011A&A...532L..13P. doi:10.1051/0004-6361/201117573. ^ Holberg, J. B.; Barstow, M. A.; Burleigh, M. R.; Kruk, J. W.; Hubeny, I.; Koester, D. (2004). “FUSE observations of Sirius B”. Bulletin of the American Astronomical Society 36: 1514. Bibcode: 2004AAS...20510303H. ^ King, Jeremy R.; Villarreal, Adam R.; Soderblom, David R.; Gulliver, Austin F.; Adelman, Saul J. (2003). “Stellar Kinematic Groups. II. A Reexamination of the Membership, Activity, and Age of the Ursa Major Group”. Astronomical Journal 125 (4): 1980-2017. Bibcode: 2003AJ....125.1980K. doi:10.1086/368241. ^ Eggen, Olin J. (1992). “The Sirius supercluster in the FK5”. Astronomical Journal 104 (4): 1493-1504. Bibcode: 1992AJ....104.1493E. doi:10.1086/116334. ^ Olano, C. A. (2001). “The Origin of the Local System of Gas and Stars”. The Astronomical Journal 121 (1): 295-308. Bibcode: 2001AJ....121..295O. doi:10.1086/318011. ^ a b Holberg 2007, pp. 15-16. ^ Brosch 2008, p. 21. ^ Holberg 2007, p. 25. ^ Holberg 2007, pp. 25-26. ^ Henry, Teuira (1907). “Tahitian Astronomy: Birth of Heavenly Bodies”. The Journal of the Polynesian Society 16 (2): 101-04. JSTOR 20700813. ^ a b c d Makemson 1941, p. 280. ^ Makemson 1941, p. 207. ^ a b Makemson 1941, p. 219. ^ Makemson 1941, p. 209. ^ Makemson 1941, p. 214. ^ Makemson 1941, p. 265. ^ Makemson 1941, p. 257. ^ Makemson 1941, p. 266. ^ Hamacher, Duane W.; Frew, David J. (2010). “An Aboriginal Australian Record of the Great Eruption of Eta Carinae”. Journal of Astronomical History & Heritage 13 (3): 220-34. arXiv:1010.4610. Bibcode: 2010JAHH...13..220H. http://arxiv.org/ftp/arxiv/papers/1010/1010.4610.pdf. Brosch, Noah (2008). Sirius Matters. Springer. ISBN 1-4020-8318-1.